STURGIS to ASHLAND – We spent some of the previous couple days riding the Black Hills with stunning canyons, small towns and historical landmarks at every S-turn. It wasn’t all about the Sturgis vendor booths! As a quick side-bar I want to do a shout out to the owners (Matt) of the Recreational Springs Resort which is a campground and motel and was within a short walking distance of the cabin we stayed. We ate food at the resort and the hospitality was top notch. I highly recommend the place. Back to the ride – If memory serves me correctly this was our seventh day on the road as we departed the 70th Sturgis rally around noon. 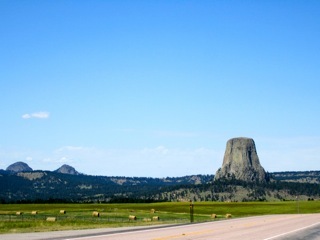 We wanted to get a couple hundred miles under our belt after doing a brief drive-by tour of Devils Tower and Hulett, WY. Getting a couple hundred miles west would be a reasonable jumpstart for our return trip home. 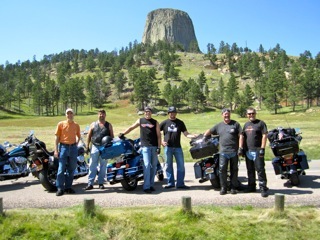 The ride out to Devils Tower has a number of long sweeping curves and some beautiful canyons and high plains. Located in the northwestern northeastern corner of Wyoming the tower rises 1267 above the Belle Fourche River. Initially known as Bears Lodge, the park has 1347 acres covered in pine forest and grasslands. After a few tourist photos in and around the tower we rode into Hulett for lunch and refreshments to cool down. With a rest stop completed we headed northeast on Hwy 112 (Hulett-Alzada Hwy). We hit a couple of rain clouds that “spit” a little on us prior to reaching Alzada at the Hwy 212 junction, but thus far the trip didn’t require us to pull out the rain gear. Amazing! 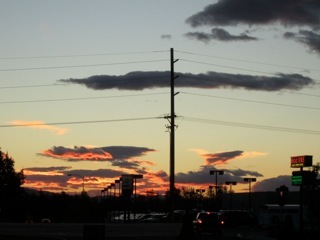 That was short lived as we soon witnessed the western sky fill with menacing storm clouds. The day prior we made motel reservations in the small town of Ashland, Montana. Not even a two horse town, but it turned out to be a brilliant move. About two hours prior to our arrival in Ashland the weather situation turn nasty. Not to let a little rain intimidate us we continued riding only to find ourselves in a drenching downpour, complete with hail, thunder and lightning. A true gully washer! The lightning was problematic and on more than one occasion the thunder “booms” had us thinking about the odds of getting struck. Even more lightning became visible on Horne Creek Butte as we traversed the southern tip of Custer National Forest. Being from the west coast it’s rare to have/see lightning let alone be concerned about getting hit on a moving vehicle. [Post Ride: evidently there are a number of motorcycle survival lightning strike stories… who knew?!] 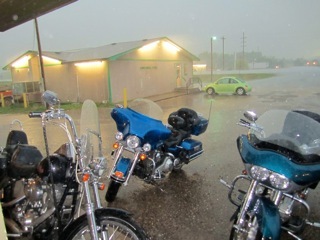 Eventually we made it to the motel as the sky open up with more rain and lightning. We caught some of the storm action by way of the iPhone video HERE and watched as the gravel parking lot flooded. In the room we stripped rain gear off and started working to get it dried out for the next day adventure. AT&T continued to deliver no phone service so the option of working out an alternative ride plan was a challenge. It was fortunate that a gal from the motel offered to shag us some to-go burgers in her automobile and we didn’t get further drenched seeking out some dinner. Bikers streamed into the motel only to find it full. ASHLAND to MISSOULA – It’s often said that a clean bike runs better, but after the previous days drenching downpour and “road foam” we dismissed that rationalization as being one for the vain and continued on with the grime laden motorcycles. The weather looked questionable so we kept the rain gear handy and put on some extra clothing to fight off the colder temps as we rode though Big Sky country. We continued west on Hwy 212 and re-fueled near the Little Bighorn Battlefield National Monument. This area memorializes the U.S. Army’s 7th Cavalry and the Sioux and Cheyenne in one of the Indian’s last armed efforts to preserve their way of life. Having been there a couple times in the past we rolled on by and made our way onto I-90. 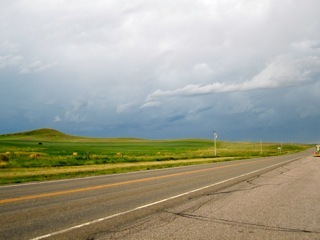 Eastern Montana is a typical high plains environment which means the area is generally treeless, semi arid and low humidity. We hit some rain showers which required rain gear between Billings and Bozeman, but by the time we grabbed a late lunch in Butte the daytime temps and summer sunshine returned to the typical August norms. 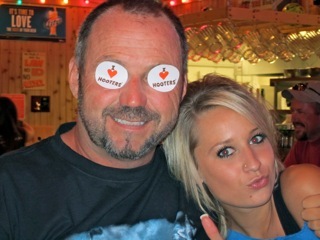 After a 468 mile day we decided Ruby’s Inn and walking across the street for chicken wings and refreshments at Hooter’s was the only way to go. MISSOULA to CLARKSTON – This is the link between the Missouri River and the Columbia River through the Rocky Mountains. From Missoula we headed south toward Lolo and traversed U.S. 12 to the Idaho – Montana border. This 99-mile S-turn filled byway, stretches across north-central Montana and Idaho. It follows the Lewis & Clark explorers’ route through the ancestral homeland of the Nez Perce people. It’s a winding two-lane road through the Clearwater River Canyon, and passes through the Nez Perce National Historical Park. We stopped at Lolo Pass for a photo op and water break. Later in the afternoon we grab some lunch at the “Cougar Canyon” station. More than a few riders have been surprised at just how much fun riding a Harley touring model can be. While no one would claim the touring models as sportbikes, they certainly can be ridden in a sporting manner. The key is finding a comfortable pace that carries your speed through the turns with minimal braking. The combination of excellent two-lane pavement with a multitude of twists and turns made this route a joy to ride. It was a relatively short day in overall miles, but with the summer temperatures stuck in the mid-90’s most of the day it felt (at least my body did) like a 500+ mile day. 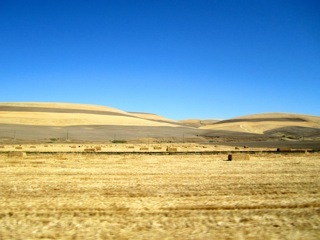 We rolled into Lewiston, crossed the river into Washington state and overnighted at a Best Western. A nice place and after a long cooling off session in the motel swimming pool the group headed to Paraiso Vallarta for some Mexican dinner specials. CLARKSTON to PORTLAND – Early in the morning we motored out of town to put some significant miles on the scooters before the summer heat took its toll. 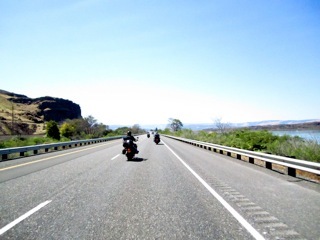 We continued on Hwy 12 to Dayton then through Umatillia, crossed back into Oregon and headed west on I-84. There was a short stop for lunch to slam down a “Bozo Burger” near Boardman, but it was the only luxury stop otherwise it was gas and go and back on the road. It was 2,947 cumulative miles later that I pulled into the driveway of home. Motorcycling teases us with the freedom to be on the road. 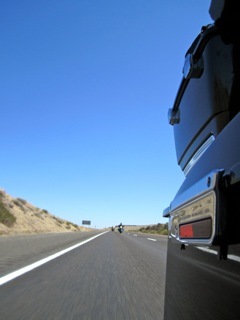 We stop when and where we wanted too, slowed down and experienced the country firsthand. We breezed through the towering mountains and blue skies and traveled across the plains. Sturgis for a third-time was a charm! I hope this travelogue makes you want to get out and ride to new places. 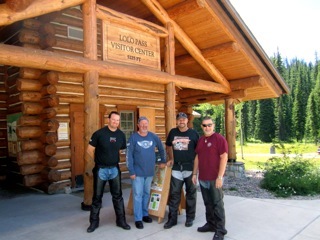 70th Sturgis Rally Travelogue – Part 1 HERE and Part 2 HERE.